After a great weekend of SUP surfing and kiteboarding in Santa Cruz; the next morning I followed the swell down the coast and met up with Eric Akiskalian from Towsurfer.com and surf photographer Mike Jones of Azhiaziam.com for a mid morning tow surf session. 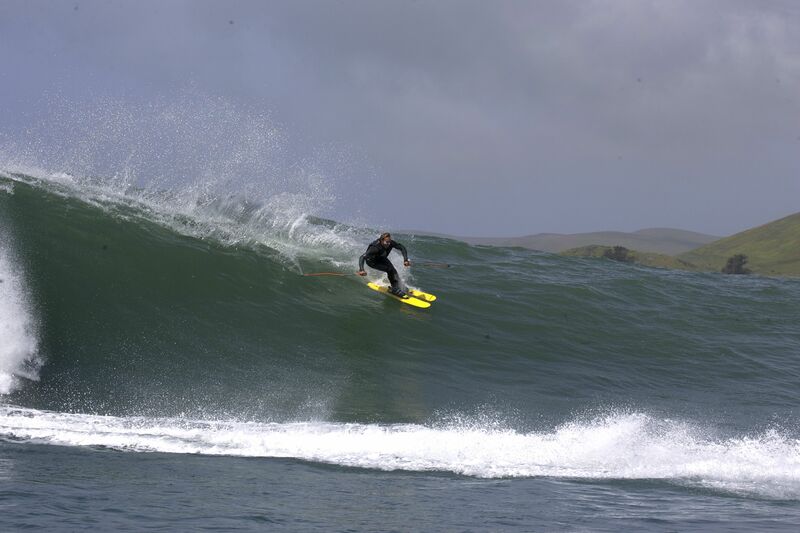 After my first wave skiing session a couple weeks ago, I really wanted to see how these wave skis worked on a steeper faced wave that had a little punch to it. 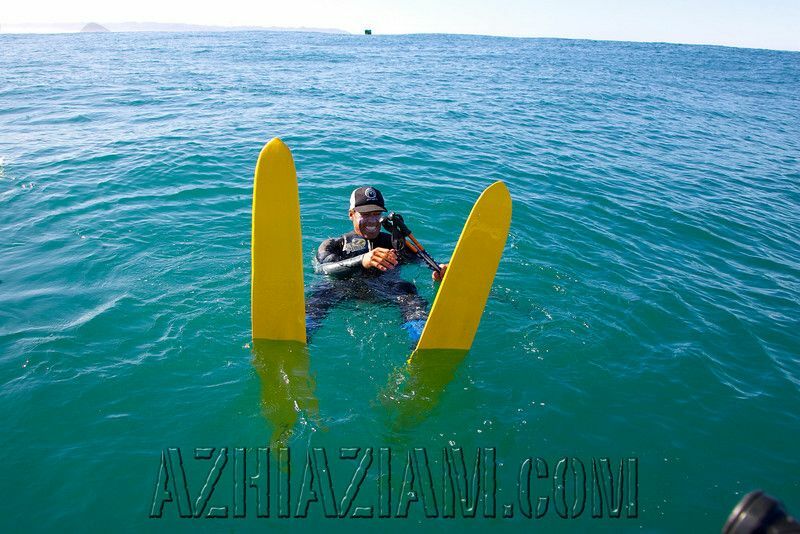 My optimal goal is to ride these skis in the tube; I just have to find the right wave with a good swell and smooth conditions. The storm that was pushing the swell down the coast, had a lot of strong winds associated with it, making it a challenge to make the call where to go. 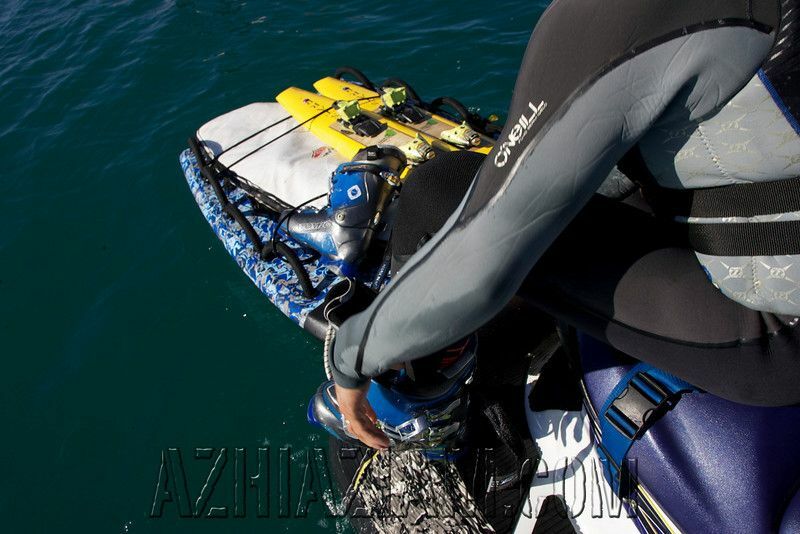 We studied the conditions early morning and decided to go for it even though there was a light wind blowing. Sometimes you can wait for days for perfection, but half the fun is about the adventure and you never know what you may find unless you go. After 30 minute of getting the jet skis, boards, wave skis etc all ready to go, we were cruising our way out of the harbor. After a quick bumpy ride up the coast we checked a couple breaks and decided to check a below sea level reef slab that breaks about a mile off shore. 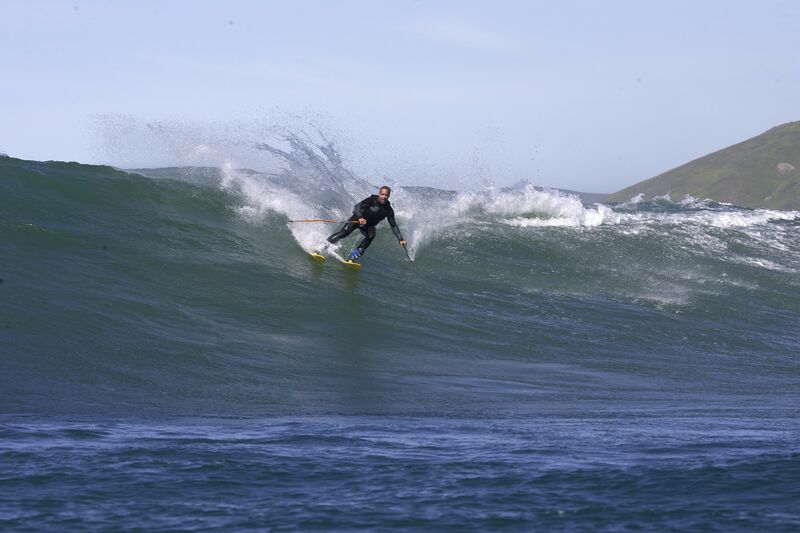 Sure enough with the low tide and building swell, there were a couple fun pits to be had. I towed my partner Eric into a couple nice glassy runners for an hour and then when we switched I opted to give the wave skis another shot in some solid, steep, fast racing pits. 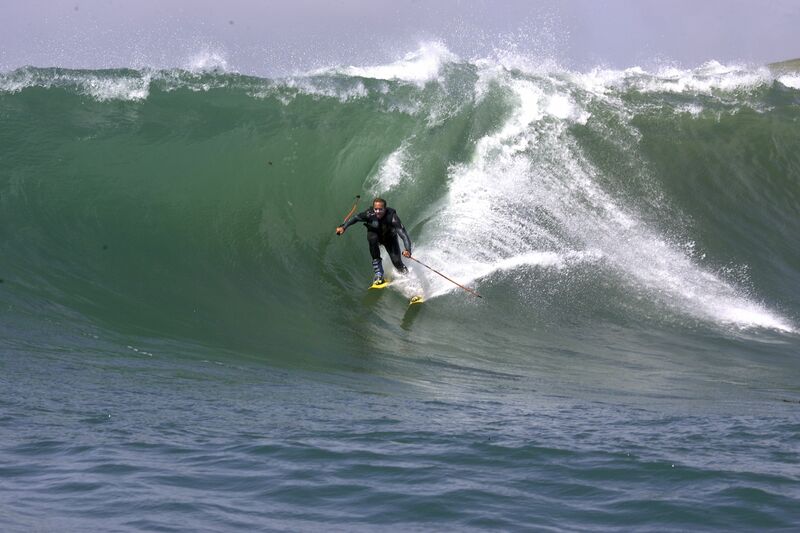 Ever since I tried the wave skis a month earlier, I really wondered how they would handle in ledgy fast waves with the obvious consequence of getting plowed and going over the falls with skis on. deep in my mind, I know it’s possible to get a tube with these skis, it’s just how big and can they hold an edge at high speed without blowing up?? kind of weird putting on ski boots while watching waves.. This time I was better prepared with biodegradable liquid soap to slip my feet into the tight ski boots. Skis on, life vest and ski poles; hand me the rope, I’m ready to do some major R&D. 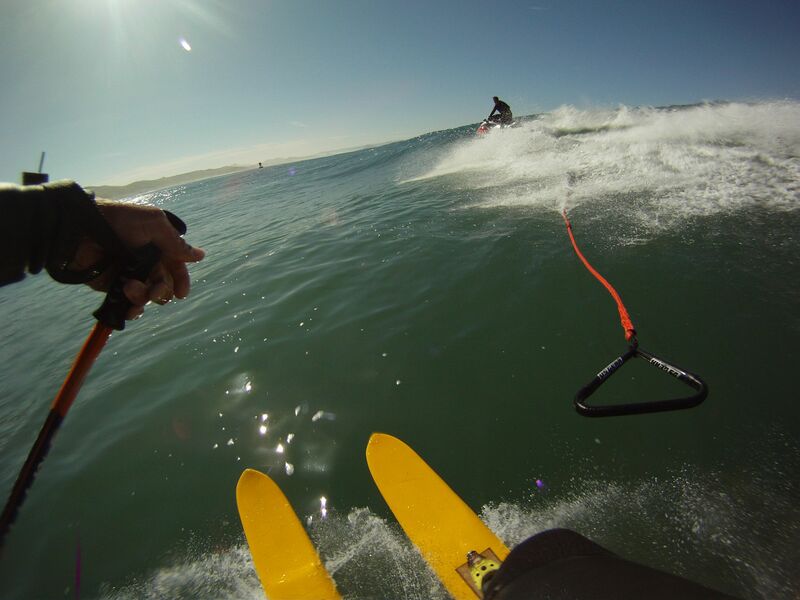 Eric throttles the ski and pulls me out of the water to the outside, where we wait patiently for a set wave. A couple minutes later, I’m up and gliding into my first bowl of the day. It’s all about getting your timing right with the way the wave hits the shelf or shallow reef. 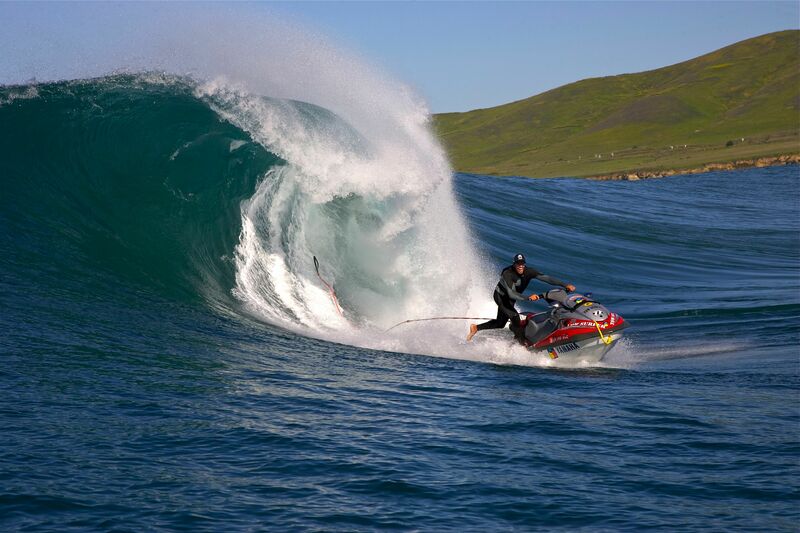 The speed i get from the whip of the jetski puts me in perfect position and I arc a sharp turn down the face, followed by another arcing bottom turn under the lip of the wave. The high speed takes me a little further past the tube section, but gives me a good idea where I can bleed some speed to set up better for the next wave. “What a rush”. whipping into the moving peak to set up for the bowl after dropping the rope. I kick out in the safety of the channel and grab the rope as Eric passes by me and we zip back out for another. 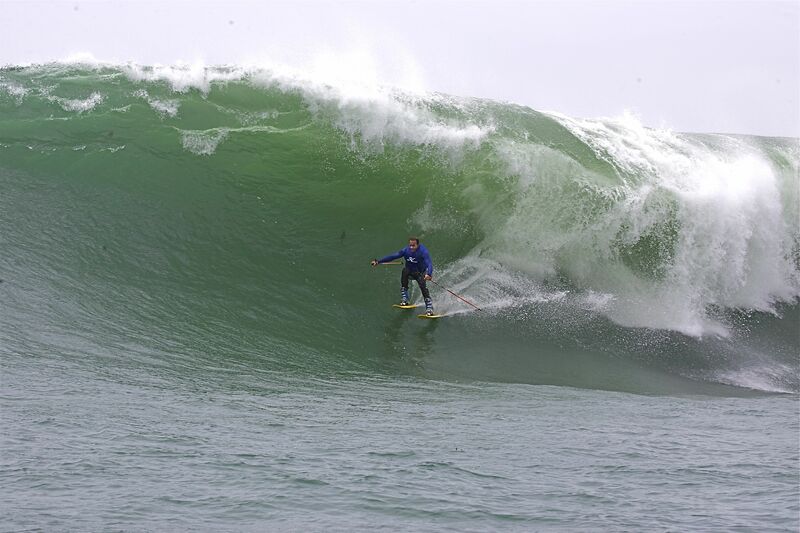 Every wave, I get better and better at managing my speed and control over the ever changing conditions. The light onshore wind leaves a slight crumble on the lip making it hard to get a clean tube, but still smooth enough to get some great rides. The great thing about this wave, is that it breaks perfectly almost in the same spot every time and if you miss time the right bowl section, you can still turn hard Left and ride it out the other way. like a perfect A frame. you can really gouge turns just like in the snow..
whipping in to these Lefts were so much fun. After about 15 waves, my confidence is peaking and I start to get a little too comfortable and thats when mother Nature gives me a good slap in the gut. I whip into this wide set wave and let go of the rope a little too early making me too late to make the section and as it closes out, I decide to ride around the exploding lip and get gassed where the white water takes my feet out from under me and knocks the wind out of me. I can’t tell you how hard that hit me, but I felt like I could only squeeze a breath in and out of my lungs the size of a ping pong ball. My skis still on my feet ; I lay floating in a little ball catching my breath for a good 5 minutes. It's a trip riding waves with both feet facing forward side by side. I got off pretty lucky, laughed it off and grabbed the rope to keep my sanity in check. If you don’t get back on the horse, sometimes that might be your last ride. Eric towed me into a couple more waves and every time after a ride, he would sling me into the next wave on our way out. 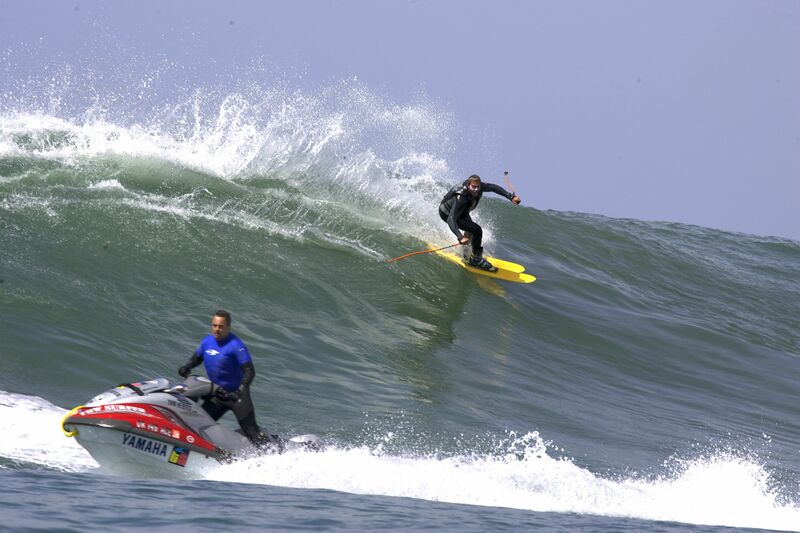 We call this move, the inside whip because you can arc the ski towards the in coming wave and do a super sharp turn whipping the rider into the face, giving the rider a burst of speed banking into the lip straight into a bottom turn. 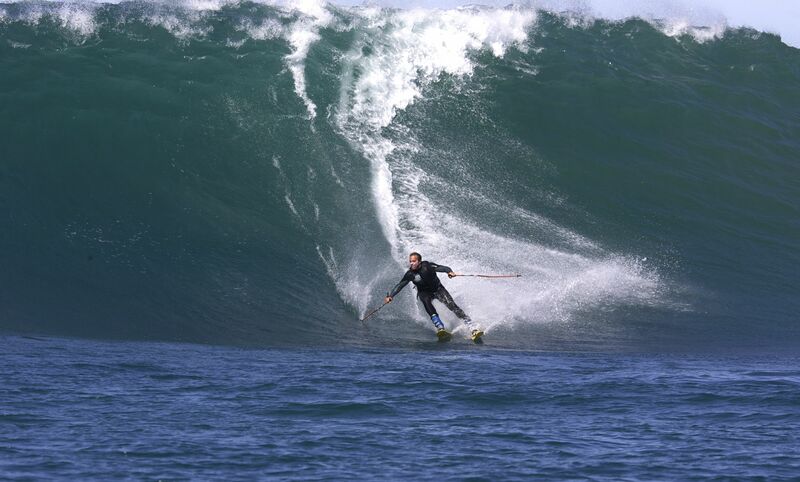 It’s a huge thrill and if your timing is on, you can almost get every wave in a set. My favorite; The Inside Whip..
An hour and 25 waves later the wind started blowing a little stronger and we all decided to call it a day. it was a great full day of hard wave skiing R&D and it gave me a new found respect for the unknown which I can’t wait to explore and push further on the next swell. 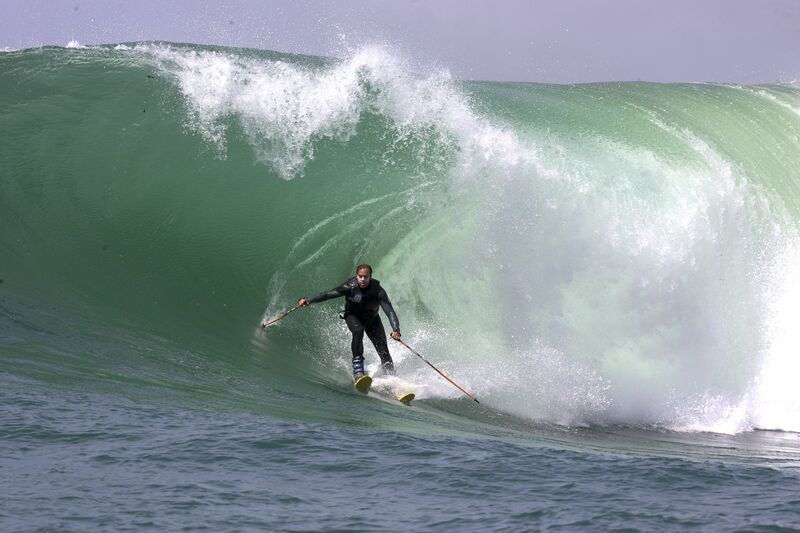 A big thanks to Eric for towing me into so many waves, to Mike Jones for shooting photos and to Jason Starr and the McDermatt brothers for custom shaping these great wave skis. 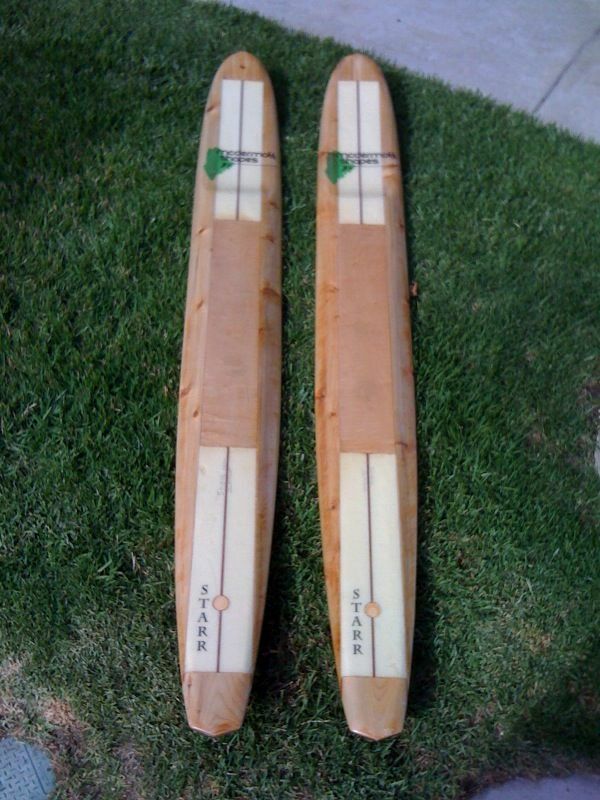 Here’ s a look at the new custom big wave skis that the McDermatt brothers shaped for me for the 50′ ft ++ days for next Winter season. Stay tuned…..